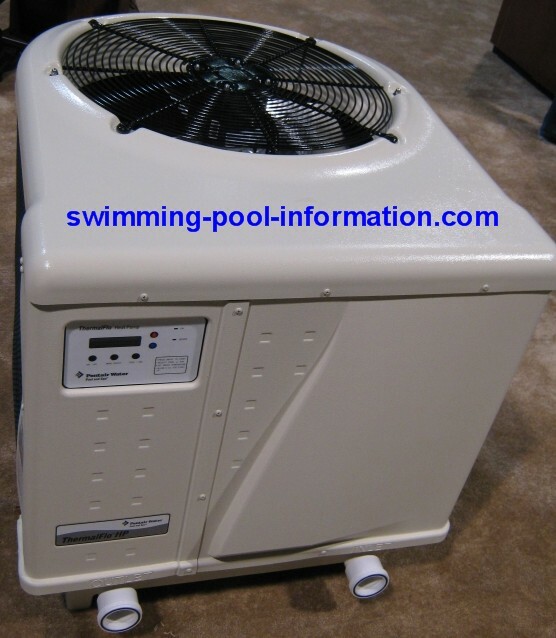 In my 30 years of service here in california, I have not come across many pool heat pumps - so I in no way consider myself an expert, but I think with rising heating costs, these items will become much more popular. I have been told by some manufacturers of gas heaters that it is not humid enough here in California compared to the East coast to make heat pumps efficient - but considering the source I am not sure that is true. The photo above shows a heat exchanger, which is different than a heat pump, but I thought I would include it because it works on the same principle but uses a lot less energy - 2 or 3 amps. 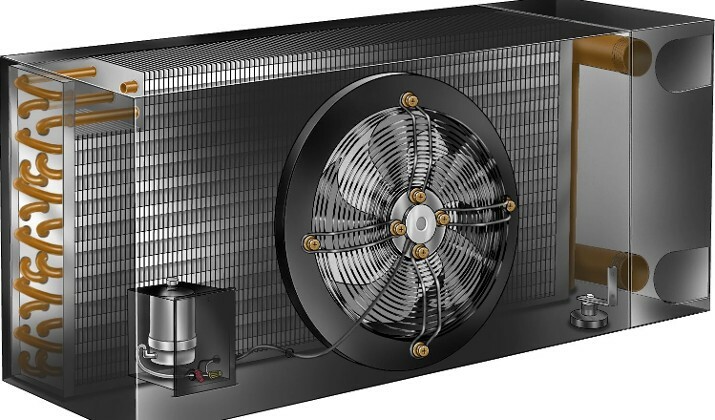 It uses less energy than a heat pump because it does not compress any refrigerant to exchange heat with water, but exchanges heat directly with the air much like an automobile radiator. This system is designed to remove heat from the attic of your home while transferring the heat to your water as shown in the drawing above right. VERY EFFICIENT! The company that produces these units claims you can heat your pool for $15.00 a month! Of course the warmer it is, the better a heat pump works, and what place is warmer than the attic? 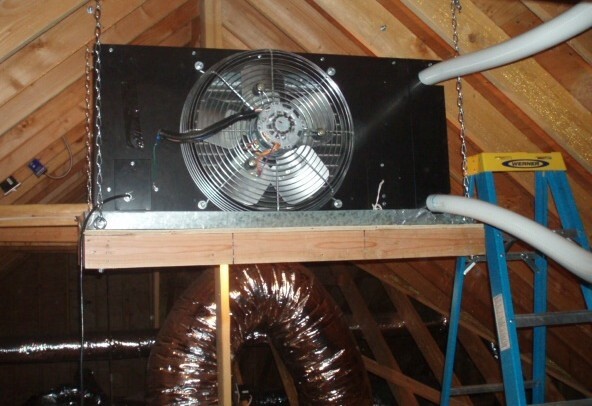 (not too mention cooling your home)......below is a drawing of attic heat exchange unit. Below that is a more common heat pump. Given a choice, the heat exchanger at the top of the page will cost less than a heat pump over the long run, but there may be certain cases where you do not have close access from attic to plumbing, or you want an easier or less expensive installation if you are paying someone else to install it. Heat pumps as pictured above have a tube inside where the water is exposed to the heat - they are usually made from titanium, cupra nickel, or another nickel alloy. Titanium is generally considered more durable - these heat exchangers usually have a 15 year warranty, sometimes a lifetime warranty. Cupra nickel average 10 years on their warranty, but they claim better heat transfer than titanium. Heat pumps are considered more economical than gas heaters, but they still need to be partnered with a gas heater if you have an attached spa that you want to heat to 100 or more degrees F. That is probably one of the main reasons there are not more of them out there, plus the fact they are usually more expensive than a gas heater. Ideally, if you have a pool/spa combination using shared equipment, using a heat pump to keep the water around 80 degrees F and then using a small gas heater to heat spa would be the most economical way to heat. If you only have a pool,ESPECIALLY if you have no gas line to equipment or the gas line needs to be redone, a heat exchanger is the better choice over a gas heater. Another consideration is electrical hook up costs - if you do not have an electrical subpanel near the pool equipment, you will have to run new electrical for the heat pump - 230 voltage, and beefy 6 or 8 gauge wires. I do want to give the idea to anybody that they can simply hook up a heat pump to their existing timeclock wiring like a gas heater and they are good to go - however, the in-the-attic units at the top of the page can be wired directly to 115-120 low amp voltage.